I haven't been able to post anything for almost two weeks so I have some catching up to do, starting with Parkin. I love bonfire night, preferably on a cold crisp evening with fireworks and a bonfire and then maybe back for a big chilli or other warming dish. 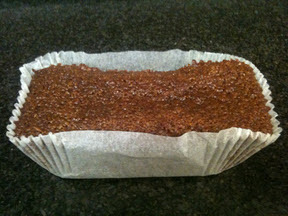 Bonfire night is also a great excuse to make Parkin. I've always lived in the south so most of my friends haven't even heard of Parkin. I have to say I think they're missing out! My mum is from Manchester and we have been making this recipe for years. 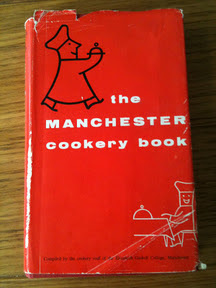 It is from a recipe book she used in home ec at school called The Manchester Cookery Book. It was a real favourite of my grandad's and I'm always reminded of him when I make it. Parkin is so easy to make. The only trick is to wrap it up tightly once it's cooked and leave it for around 2 weeks so it becomes all sticky and gorgeous. I always make two loaves so that when I can't wait I have one to eat and one to save. You start by melting the fat and syrup slowly in a pan. I use half margarine and half lard (well I actually used the vegetable version). While it is melting put all of the dry ingredients in a bowl and make a slight well in the middle, stir in the syrup mixture and once incorporated mix in the milk. Pour into two 1 litre loaf tins and bake for about 1hr 15mins. As this is an old recipe book it doesn't specify the oven temperature but I sent it to about 140C in a fan oven so maybe 150-160C if you don't have a fan oven. Once it's been left for a couple of weeks unwrap and serve with a glass of ice cold milk. Delicious!